They are an integral part of ‘KUSWAR’ (tray filled with traditional Christmas goodies) which are served when friends & family visit during Christmas. They are also distributed to neighbours & shared as gifts along with other traditional sweets. 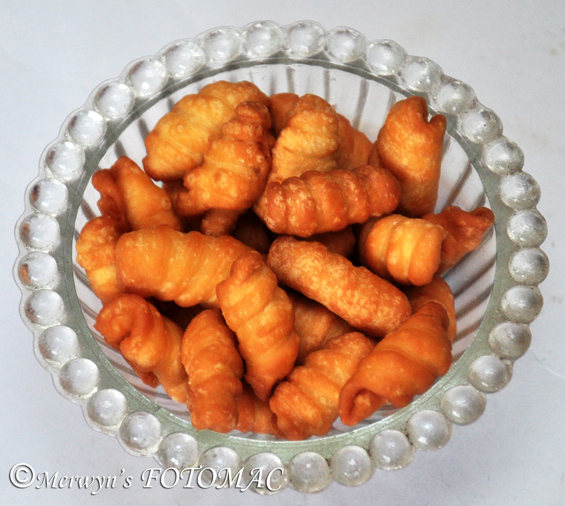 There are slight variations in the recipe for Kulkuls depending on whether you like it crunchy, crunchy & soft, with or without glaze, frosted, lightly dusted with sugar powder… Sleekly rolled kulkuls look very pretty than the thickly rolled ones. Add ½ cup of warm water to 1 ½ cups of freshly grated coconut & grind to a fine paste. Pass through a fine sieve or fine cheese cloth/muslin cloth & squeeze using your fingers to extract coconut milk. This should give you about ¾ cup of coconut milk. Discard the squeezed coconut solids or use as desired. In a sufficiently large bowl, combine flour, sugar, salt & oil. Then add the egg & mix to resemble bread crumbs. Use a little coconut milk at a time & knead to a smooth, elastic & pliable dough. The dough should not be sticky. Turn out the dough on to your work surface or rolling board & knead using your fingers & palms to the desired consistency. You may use more coconut milk to achieve the right dough consistency. Place the dough in a bowl & keep it covered for about 15 to 20 mins. If using semolina/rawa, then you need to keep it longer about an hour or two for the semolina to soften. After the dough has rested it is time to mould the dough into kulkuls. 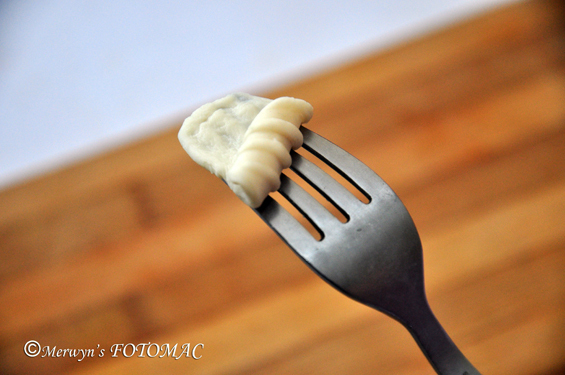 Use special moulds, a comb or the back of a fork to roll the curls. To do this, first pinch off little bits of dough & roll them into smooth balls a little larger than a pea. Work with one little ball at a time leaving the rest of them covered so that they don’t dry out. 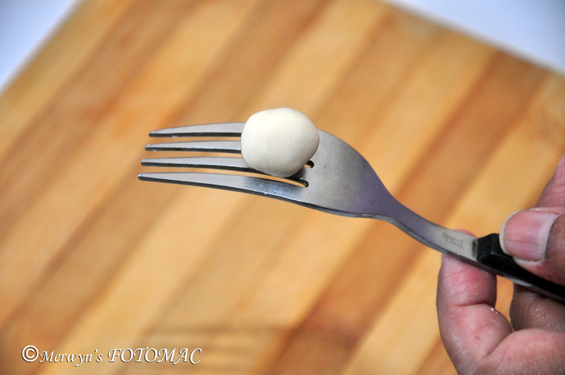 Place a small ball of dough on the roller/fork/comb. Using your fingers, press down lightly & flatten the dough into a uniformly thin rectangular shape that covers the roller. Roll the rectangle from one end to another with your fingers. Seal the edges well with the fork without losing the indentations formed by the ridges on the mould/fork/comb. 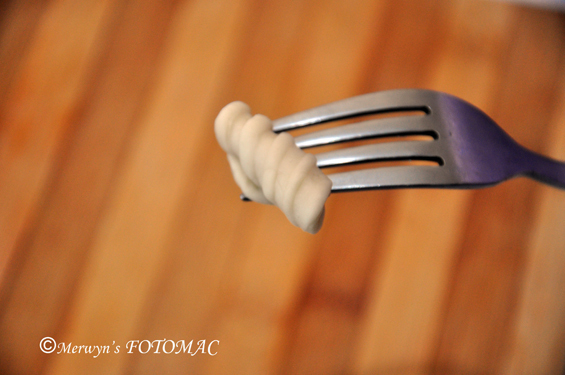 This indented rolled piece of dough is called kulkul/curl. Place it on a lightly floured plate/tray. Use up all the dough to make kulkuls. In a kadhai/wok, heat oil till hot. Do not over heat the oil till boiling hot. To test, just drop in a bit of dough into the oil & if it bubbles up & rises to the surface, then it is time to deep fry the kulkuls as the oil has reached the right temperature. 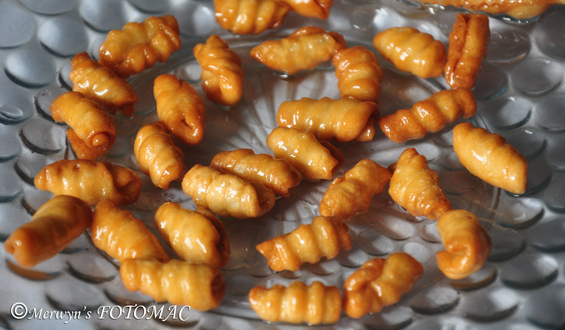 Deep fry kulkuls in small batches. Once you drop them in the hot oil, they will come up. Using a slotted spoon, keep turning them over frequently so that they cook & turn to light pink uniformly. Adjust the flame accordingly. Once they are cooked & done, drain them completely using a slotted spoon. Transfer them on to absorbent paper towels/tissue. Remember the kulkuls will continue cooking for sometime once you drain them out from the oil. If you like to dust with sugar powder then do it when they are still hot or you can glaze them later when they cool down completely; preferably the next day. If you do not want to glaze or dust the kulkuls then make sure you sweeten the dough well before moulding into kulkuls. If you plan to glaze the kulkuls the next day, heat sugar & water in a pan. Stir to dissolve the sugar completely. Bring to a boil & then allow the sugar syrup to reach a one string/thread consistency. Drop the cooled kulkuls into the syrup & shake the pan, or use a spoon to mix & coat the kulkuls evenly with the sugar syrup. Transfer them quickly on a large plate or tray. Immediately separate them with a fork so that they do not stick to each other. Let them cool to dry out. Then store in an airtight container. For frosted kulkuls, the syrup should be thick (soft ball consistency). Enjoy at Christmas or eat if you feel like it!